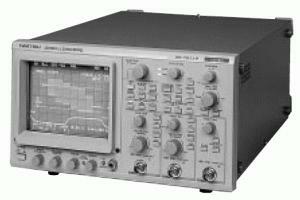 Based on Iwatsu Test Instruments Corporation'''''s renowned SS-7800 "Mr. Analog" Series Oscilloscopes which provide excellent basic performance and easy-to-operate features, the new Programmable Oscilloscopes SS-7840P/7830P/7825P/7811P/7804P have been developed exclusively for manufacturing line use. With a built-in CPU, programming functions are made simple, and the setup data can be loaded to the oscilloscope from a personal computer. This greatly reduces the re-programming procedures that are inevitably required when the product on the line is changed. Quicker response (when compared with control via a GP-IB interface) also contributes to improved productivity. Iwatsu Test Instruments Corporation's peripheral components (optional accessories) developed based on many years achievements will also simplify the re-configuration of your manufacturing line.